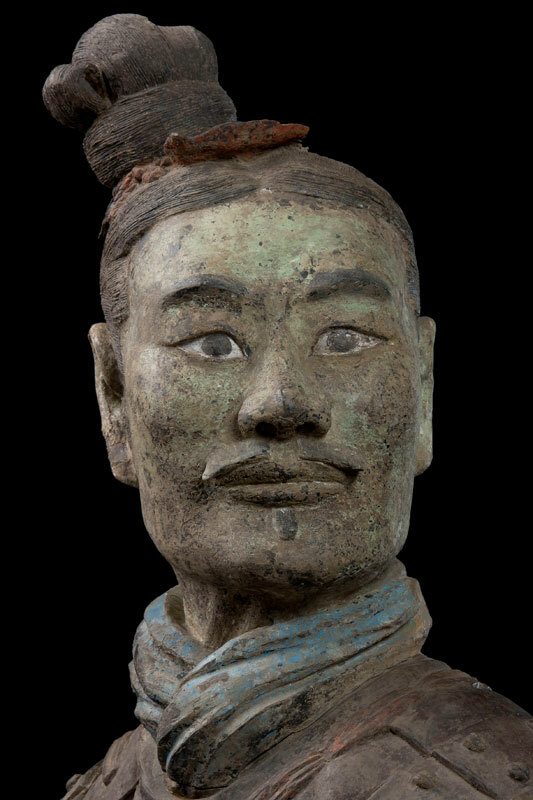 I set out this morning with high hopes of seeing the two-thousand-year-old terracotta tomb warriors and other artifacts from the Qin Empire (the era of the First Emperor of China) now on exhibit here in Minneapolis. Except for the cleaning and other Thanksgiving preparations I’d planned, the other part (the relaxation piece) of this time-off hasn’t gone entirely as planned. Hubby wound up having to return to work early, his time-off eroded by a few sick days. We managed a fine-dining night out (having earlier thought of a weekend getaway), and squeezed in the latest James Bond movie. All in all, not bad, but I’d hoped for more than a break here and there from the vacuuming and baking. I had one last chance for a bit more culture, so this morning I decided to head out on my own to the exhibit. After a smooth, fast drive on the interstate, I arrived near the museum and discovered that gridlock squeezed every side-street to a single lane. Gridlock involving numerous school busses. I had so looked forward to visiting what is essentially a graveyard for its prospect of peaceful contemplation among the silent, giant warriors. School busses filled with lots of lots and lots of school kids didn’t sound like peaceful contemplation to me. My quest to see the Emperor and his army came to a dead end amid the gridlock surrounding the museum. So I returned home via the grocery store (needed more cream and eggs – so it is with a week of baking), and spent much of the day making pies, lots of tiny little pumpkin pies. Used my favorite crust recipe (a two-hour process that is not so laborious, but does require two hours – with lots of resting, chilling, freezing, pie weights), and a new custard recipe (no evaporated milk – just cream, eggs, milk, brown sugar, spices – and, of course, pumpkin). The delicious ancient smells of ginger, cloves, nutmeg, cinnamon filled the kitchen with otherworldly incense. It was pokey work making a lot of tiny pies, but I had the extra time, and when they were finished, and I lined them up in little rows, entombing them inside a covered pyrex dish to keep the marauding pets out. Tomorrow – more baking, more preparation, a bit more cleaning, and then the feasting day arrives. This entry was posted in Uncategorized and tagged baking, china, museums, pie, Thanksgiving, war, writing. Bookmark the permalink.